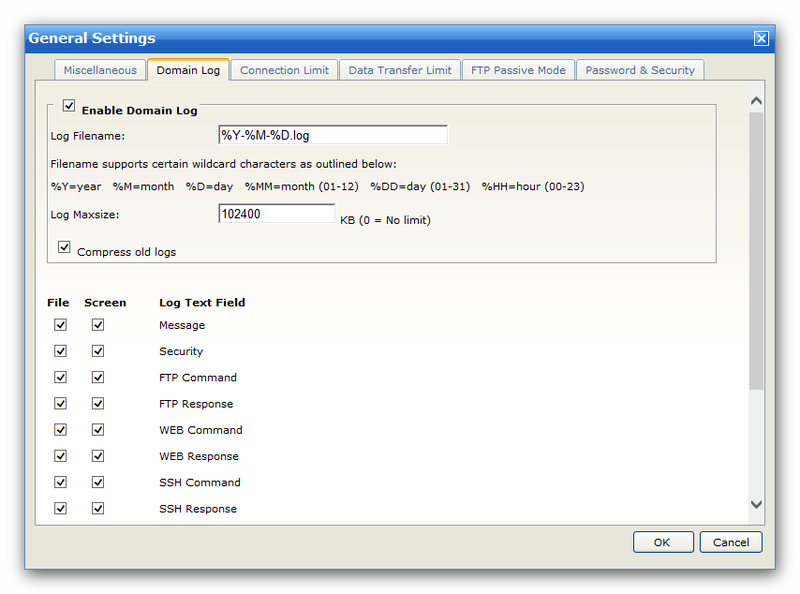 Here you can configure settings for domain log. The log file must be given a name before information can be saved to a file. Your domain log file will be put in the "Log\Domain Name" directory. The log filename supports certain wildcard characters as outlined below. The log file will be ignored if it reaches the limit you defined. The log of the previous day will be automatically compressed and saved. After that, the original text format log file will be deleted in order to save disk space. For each type of information that can be logged, there are two options. The first check box indicates that this particular information should be logged to the message area of the domain log page. The second check box indicates that the particular information should be logged to a file. Check the option for screen or file logging for any information that is of interest to you. Please be aware of performance impacts, and the size of log files, when selecting this information.